BUT, I NO LONGER HAVE THEM!!!!!!!! I can’t begin to tell you how much I regret that somewhere along the way I lost or threw out those sheets of data. All I can say is that for many years my career as an anthropologist became focused on Brazil. When I returned to the States in 1980 little by little I did get back into kayaking, first with a rented Chinook and then with a Chinook-sized “skin-on-frame” that I built. And then in 2003 I was introduced (online) to Harvey Golden of QajaqUSA. As a result, I did my usual “Greenland slide show” at the Delmarva Paddlers’ Retreat in 2004. And ever since then, at the suggestion and with the encouragement of members of QajaqUSA, I’ve been slowly putting together this website wishing, of course, that I still had all that valuable information. Here it is, completed I think it was that very same day, with all its hunting gear in place as I carried it down to the shore to try it out for the first time. Part of the plan for my time in Illorsuit was, of course, to have a fully equipped kayak made for me and to bring it back to Scotland. Already while in Uummannaq town on my way to Illorsuit someone suggested that I ask Martin Zeeb (Johan’s brother) if he would be able to do that. And he agreed to do so. But when he returned to Illorsuit a few days later it turned out that he was going to be working in the village store and wouldn’t have the necessary time. He suggested that I check out an old kayak of his brother Abraham’s or, if that wouldn’t do, that I ask Emanuele Korneliusen to build the kayak. Sakeus mentioned that it could be done in a few days work. I went along to try out Abrahams’s old kayak but it was not in good condition and was too tight a fit for me. Once he understood that Martin really couldn’t do the job, Emanuele agreed to build the kayak (and also a second one for John Heath), so we arranged to go and buy the wood from the store the very next day. As well as Martin Zeeb evidently being a reputable kayak builder, if I remember right, Drever had told me that it had been Knud Nielsen who built his kayak back in 1938. And it seemed clear that Knud was essentially supervising Emanuele’s work on my and Heath’s kayaks. Actually, the impression I had at the time was that the job was “given” to Emanuele in part because he was a “retired” kayak hunter and one of the less well-off villagers and it would be (and of course it was) a good opportunity for him to earn some needed cash. And, as I hope the photos clearly show, he did an absolutely beautiful job of building those two kayaks. Please note that, over the years, there has been some confusion about how to spell Emanuele’s name. I now have it from his granddaughter Paninnguaq that the correct spelling (as used by his family) is: Emanuele Korneliusen. Meantime, Karl Ottosen had persuaded me to try his. He was one of two men I met in Illorsuit who had “kayak angst” (I had met another man with the “angst” at Uummannatsiaq). Since this had become enough of a problem for him that he had recently had to give up kayak hunting, Karl was very keen to sell me his kayak. But it was way too tight a squeeze for me, tho’ I did manage to get in, so I was able to refuse his offer. After all, what Drever and I really wanted was to have one built from scratch for me! On September 4th, I went with Hansi (who’d just been helping me make a minor repair to the bow piece of my Scottish kayak), Emanuele, and Gunnar to the storage attic to pick out the wood we would need. Perhaps because it was late in the summer the selection was very poor. We did find enough for one kayak and I pointed out to Gunnar that what remained wasn’t good enough to make the second kayak for John Heath. He said he’d order some more from Uummannaq. The supply of split willow for the ribs looked really awful but Emanuele took some off home to soak and we put three usable boards (two for the gunwales and one for the keelson, etc.) outside to measure later. It was sold by the “English foot” the Danish foot being slightly different. The store in Illorsuit didn’t have any coaming hoops in stock and eventually I had to buy them in Nuugaatsiaq. These were, in fact, mast hoops as used on old style sailing boats. Also, of course, imported from Denmark. For some strange reason, the two I bought in Nuugaatsiaq turned out to be slightly bigger than the ones on all the other Illorsuit kayaks. Hansi’s wife Anni who made my spray skirt/waist band (tuitoq) was quite upset when she made it according to the local standard size only to find that it wasn’t quite big enough and had to be enlarged! These mast hoops, by the way, are not just obsolete memories of a distant past. In 2004, when I built my replica of the kayak Emanuele made for me, I had no trouble locating and buying an appropriately sized mast hoop. Emanuele working on my kayak behind his house. Shaping a rib. I missed seeing how Emanuele measured the length for the ribs but he had soaked them in water for a day or two and was able to bend them to shape with just his two hands and his teeth. [It seems that I’d been filming him with the defective movie camera as I don’t have any still color photos of him doing the work. On the 9th I did take these few b/w with a different camera.] Golden mentions in his “Kayaks of Greenland” [KoG] that in some of the museum specimens he measured you can see actual teeth marks on the ribs! (e.g. page 191 about kayak #18). The kayaks, as we’re all tired of hearing, are made to measure for their owners. So the first step was to take my measurements. Knud and Emanuele did this by marking what they needed with blue chalk (my memory’s a bit vague on this) on a single piece of cord just a bit longer than my height. I remember being surprised (impressed?) that all the relevant measurements were marked in that way within the same length of cord. They then offered to make a slightly wider than usual kayak for me. But by that time I’d been checking the fit of Ludwig’s which he was offering to lend me for me to go hunting with. It seemed to fit me well enough, so I insisted that mine be no wider than his. Also by that time I’d been able to try out several different kayaks — at Ummannatsiaq, Ikerasak, Qaarsut and at Illorsuit itself. So I knew that I could use a little more depth than seemed usual in the hunters’ kayaks. Just that little bit that would allow me to very slightly bend my knees. 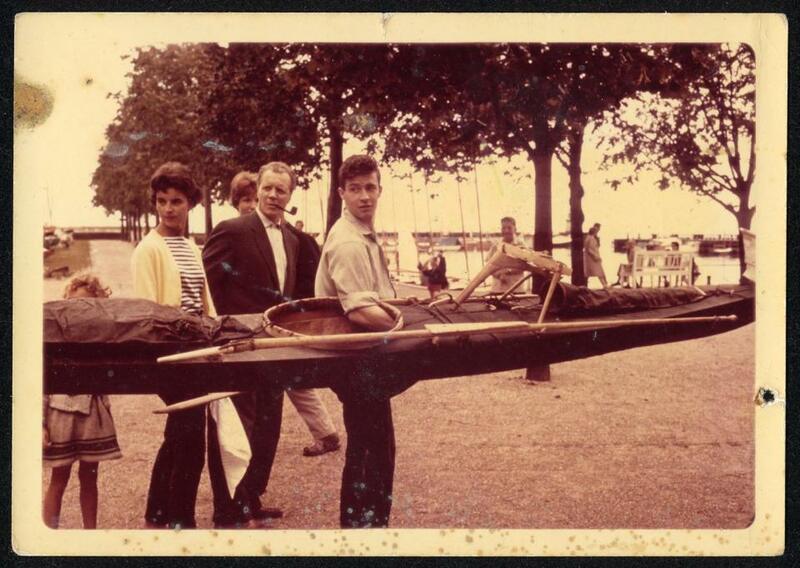 Emanuele did provide for this — certainly once I’d managed to squeeze into it, the kayak was always a comfortable fit. And yet, when I look at Winning’s drawings of the kayak nowadays I’m impressed to see how low the fore deck is. Quite as low, to my eye, as on the village hunters’ own kayaks. If I’m right about that, then the extra depth that Emanuele did give my kayak was in the shape and size of the ribs and didn’t affect the shape of the masik (the principal fore deck beam) and the fore deck itself. 1) the beam or width. Emanuele made it with exactly the same width as Ludwig Quist’s (20 15/16 inches). And Ludwig won the village race in that kayak! 2) the depth to sheer. At my request he did make it slightly deeper than any of the Illorsuit kayaks. At 7 13/16 inches, however, it is only 1/16 of an inch deeper than the deepest of the Type VI kayaks in KoG. 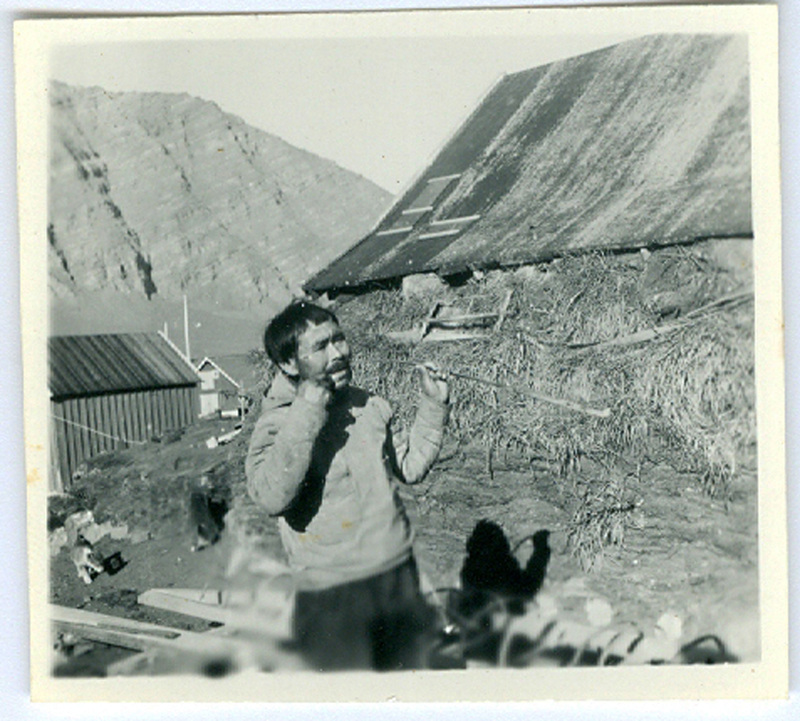 That one is a kayak from Upernavik, collected in the 1960s (KoG, page 316). Heath’s kayak was made to be 5/8 of an inch wider than mine and one inch deeper. When I went to Emanuele’s on the 8th to see how the work was going, he already had the gunwales and deck beams all fitted together. But it looked a bit too wide! So we checked Ludwig’s and yes, mine was set to be wider. As I wanted a typical Illorsuit style kayak, as far as possible, he narrowed it down to be the same width as Ludwig’s. He did, however, mention that Sakeus’ and Ludwig’s were wider than most. Emanuele, using his old fashioned frame saw, with the structure of my kayak close to complete. The next day he had the ribs all in place and adjusted and was sawing out the keelson piece when the wood broke at a knot. Later that same day he had spliced it back together again over three ribs and had tied it down to the gunwales and it looked like it would be fine. By that time he also had the side stringers lightly tied in place. 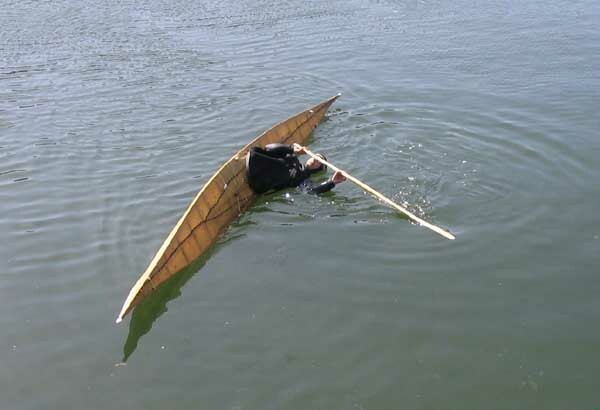 In these two photos you can clearly see how the ends of the keelson were shaped to extend upwards (the kayak is upside down, of course, in the photos) to meet the lower surface of the gunwales. The keelson of Heath’s kayak is also shaped in that way. What that meant, of course, is that they had to be cut out of a fairly deep board, very much deeper than the vertical thickness of the keelson along most of its length. That’s what I was referring to when I spoke of one of the boards we bought at the store being for “the keelson, etc.” The piece cut out of the keelson board will have been more than big enough to provide some if not all of the deck beams. 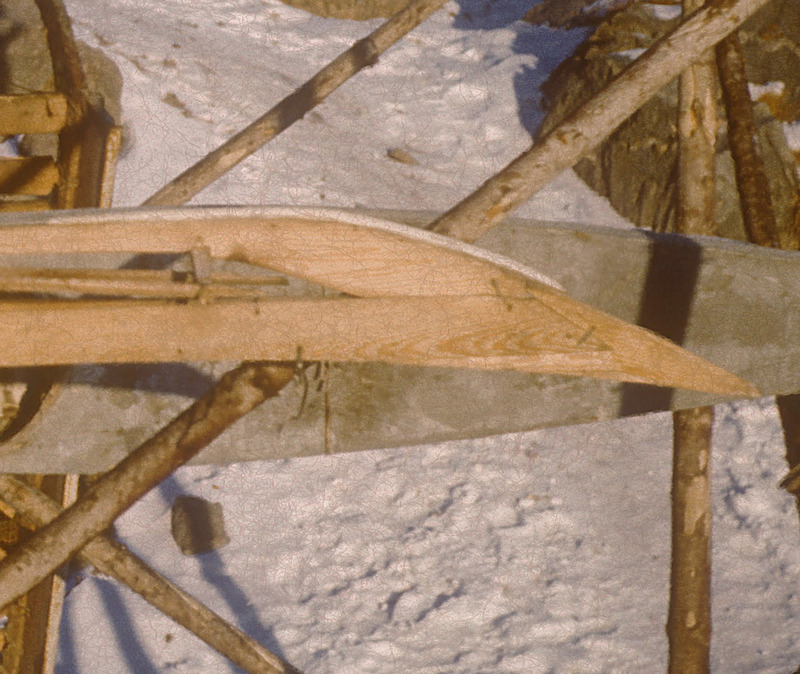 This shows the bow details of one of the Uummannaq town kayaks. The design is not quite the same with the keelson, gunwales, and stem piece fitting together in an interestingly different way. Just as in my and Heath’s kayaks, gunwales, keelson and stem pieces are lashed together. In both kayaks, this plus joining some of the deck beams to the gunwales, plus attaching the ends of the side stringers to each other are the only places where lashings were used. Especially in this photo of the Uummannaq town kayak you can see how the ends of the side stringers were not attached to the keelson. “If they were attached to the actual [end plates of the keelson] the kayak frame would not have enough give in rough seas” (Petersen 1986, page 27). An interior view of Heath’s kayak which shows the lashing of (certain of) the deck beams to the gunwales. Notice how on the first deck beam ahead of the masik you can see clearly how the lashings go to the forward half of the beam on the right hand side and to the rear half of the beam on the left. “This is done to prevent torque on the deck beam; such a force can fracture the deck beams tenons” (Golden KoG, page 56). On the 11th the weather was nasty so we agreed Emanuele would take a break from the work. The next day was the big gale! Then a day or two when I was busy making a flysheet for the tent. By that time the frame was close enough to complete that we took it to the village dance hall — a gift to the village from Rockwell Kent. They had me sit in the still not quite completed frame so they could mark the exact positions for the knee and toe beams. And then the three Nielsen brothers (Knud Nielsen was their father, by the way) and I left for the hunting trip to Umiamako (see Chapter Eight), so I missed the rest of the building of the kayak. Here is Duncan Winning’s scale drawing of the finished kayak. This is the drawing which, in due course, led to the creation of the commercial Anas Acuta kayak (see below). 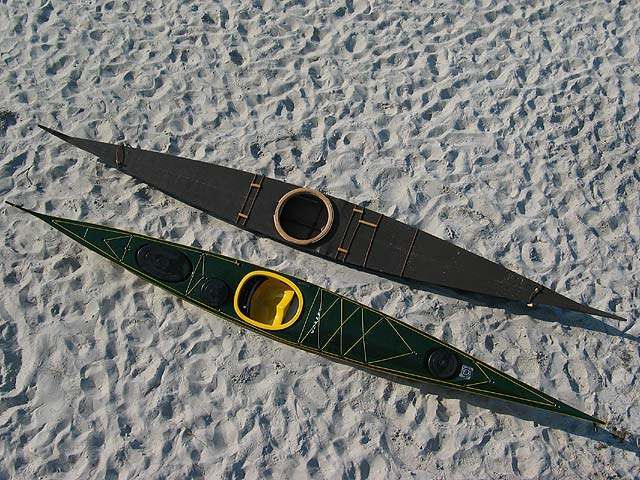 The kayak Emanuele made for John Heath. The late John Heath, a noted scholar and historian of Arctic and sub-Arctic kayaks, had been in correspondence with Drever in the months preceding my trip to Illorsuit. Drever put him in touch with me and Heath asked me, if this were to be possible, to have a fully equipped Illorsuit style kayak built for him. So the plan was that once he had built the kayak for me, Emanuele would build another one for Heath. Here is one of Golden’s scale drawings of Heath’s kayak, copied with his kind permission from his KoG page 314. As you can see from the drawings, the two kayaks are almost identical. Emanuele working on Heath’s kayak behind his own house, with what appear to be very ramshackle saw horses (more below). 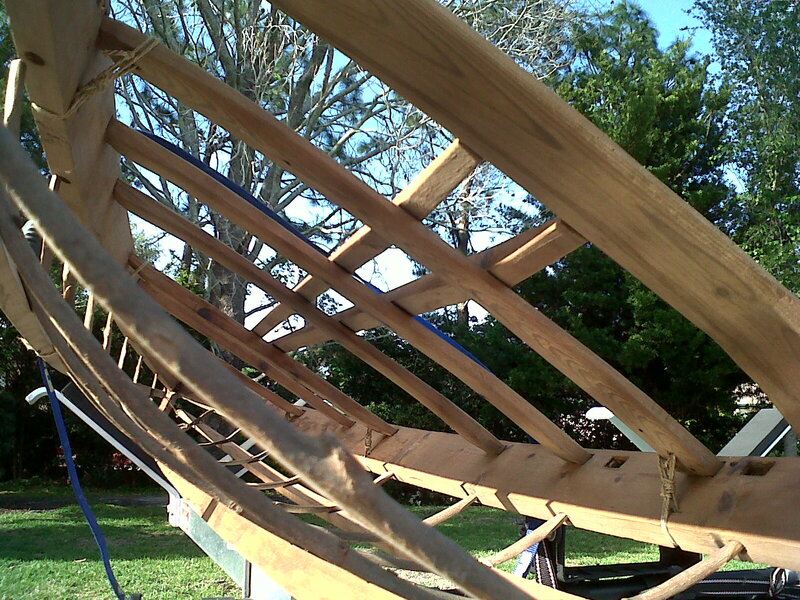 He has the gunwales shaped to fit each other at bow and stern, the deck beams and ribs are already in place. Before he began, when I checked the length of the lumber he was about to use for the gunwales it turned out to be 11 inches shorter than the gunwales on mine. 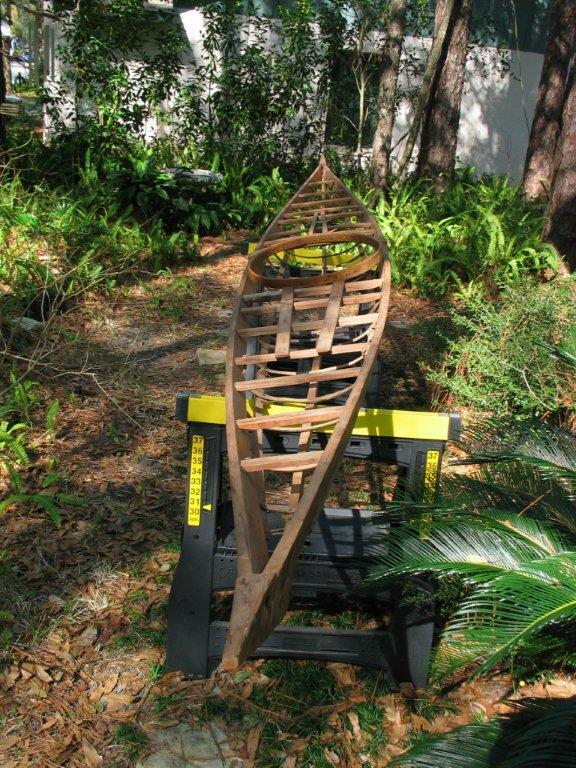 He said he could scarf on enough to make the gunwale pieces the same length as in my kayak. A few days later, when I checked on how the work was going, I found that Emanuele was making it to be exactly the same width as mine. Apparently, we’d had a misunderstanding. When we talked some more about it, we decided it would be better to make Heath’s kayak slightly wider than mine [I knew from letters that Heath was both taller and heavier than I]. That must explain the “extension” of the masik that Golden noted and shows in his KoG figure 309, on page 351. As I’ve mentioned, Emanuele also made Heath’s kayak slightly deeper than mine. Here he’s made an adjustment to one of the ribs and is putting it back in place. He had made quite shallow mortises in the gunwales, by the looks of them just with a knife. Here he has all the ribs sized and positioned to his satisfaction. So he’s now ready to attach the keelson and the side stringers. The day my kayak was being skinned, I had checked in with Emanuele who was working in the dance hall. He was quite upset as he’d just found out that the two gunwale pieces for Heath’s kayak were not bending equally. Part of how he solved that problem shows in the photo below. He’s shaped the ends of the two gunwales a little bit differently from each other. That and his having to add the scarves to the ends of the gunwales (one clearly visible in this photo) presumably helped him get the gunwales to bend the way he wanted. One of the most well known and respected authorities on Greenland kayaks is H. C. Petersen. He was born in Greenland and spent many years living there. 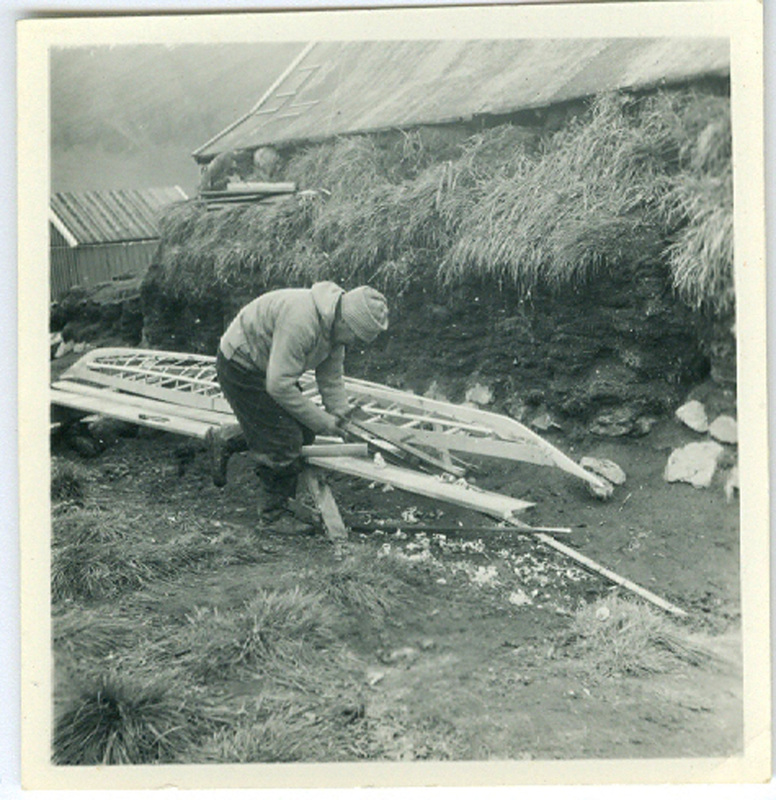 His tri-lingual book Instruction in Kayak Building (1981), and his Skin Boats of Greenland (1986), are probably the two best sources we have on how to build a (west coast) kayak. 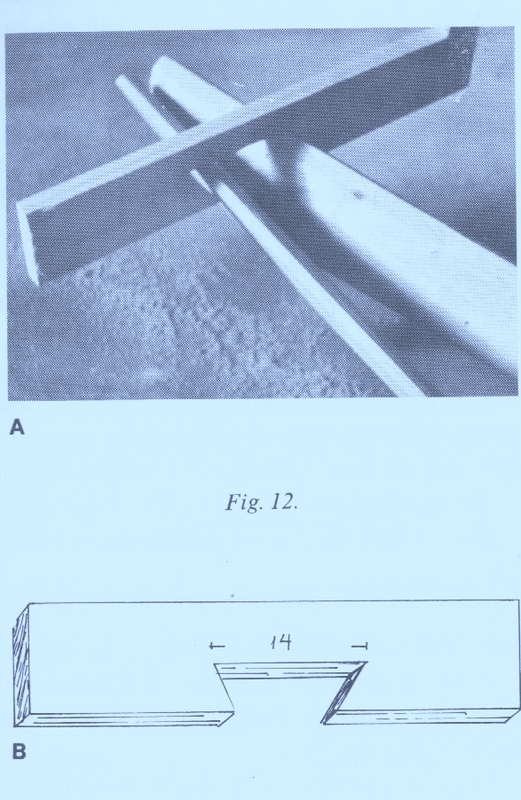 In his book on kayak construction, Petersen describes the use of templates to determine the flare (outward lean) of the gunwales (1981, page 24). To the best of my knowledge, Emanuele did not use any such templates in his work. I never did see exactly how he set the flare of the gunwales for either my or Heath’s kayak. [The angle of gunwale flare (angle off the vertical) of Heath’s kayak is 16 degrees and of mine is 18.5 degrees.] He did use a cord “windlass” pulling the gunwales together (visible in all four photos above) but the cord he used is passed around the entire gunwales, not attached just at their lower edges. Still, even such a windless together with the usual setting of the deck beams just below the top edges of the gunwales would, of course, have put some flare on the gunwales. By controlling the tightness of the windlass, by that alone, he may perhaps have produced the gunwale flare he wanted. But now (that is in 2013), looking at these photos, I have to wonder if the odd slope of one of the saw horses he worked with might’ve had something to do with it. What I have in mind is that the angle off the horizontal of that saw horse with Heath’s kayak resting on it in the above photos looks to be quite close to the angle off the vertical, i.e. the flare, of the gunwales. Has anyone ever heard of something like this being done? So here it is! In Uummannaq town, ready to be boxed up and shipped to Seattle where Heath lived at that time. I like how well this photo shows its elegant sheer. The effect of this keel shape is a bit like that of a skeg in improving the directional stability of the kayak. “Integral skeg” is one way of referring to this shape (see Golden KoG, page 284). Discussing my and Heath’s kayaks’ keel shape Golden has this to say: “Both Taylor’s and Heath’s kayaks have an unusual keel-line aft of the cockpit. While drawing up Heath’s frame, I had initially thought I read my offsets wrong, but when I looked at Duncan Winning’s drawing of Taylor’s kayak, I saw the same keel-line as I had just drawn. The keel rises behind the cockpit, levels out for two feet or so, and then rises abruptly up to the stern. This keel form is similar to the pequngasoq described by H. C. Petersen … but is much subtler than more southerly examples …” (KoG, pages 349-50). This is the only one of my photos where it may be possible to see the pequngasoq like profile of Heath’s kayak. By zooming in I think I can just almost make it out. 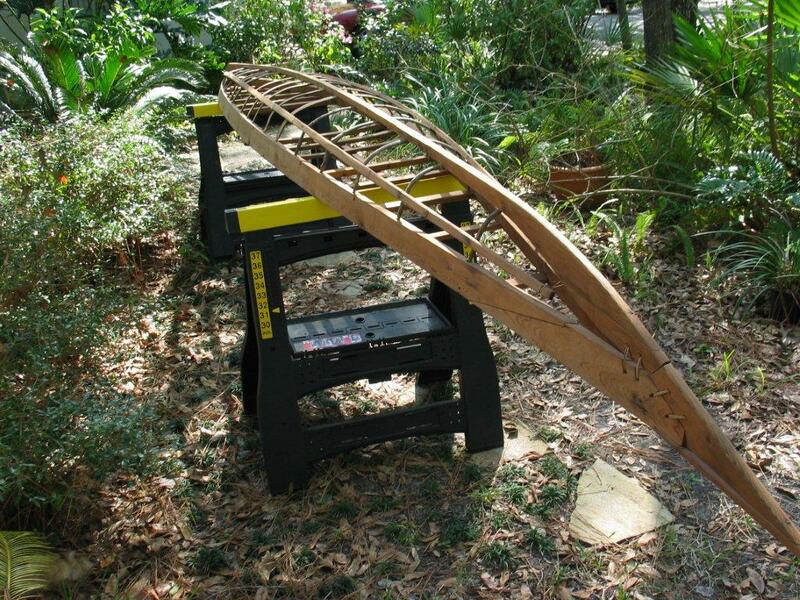 When I was building the replica of “my” kayak, in 2004, soon after having met Harvey Golden online, I noticed the same shape in Winning’s drawing. And I wondered: did Winning make a mistake? did Emanuele make a mistake? And then I remembered that Harvey Golden would soon be examining my work so I decided to go ahead and build it as in the drawings. 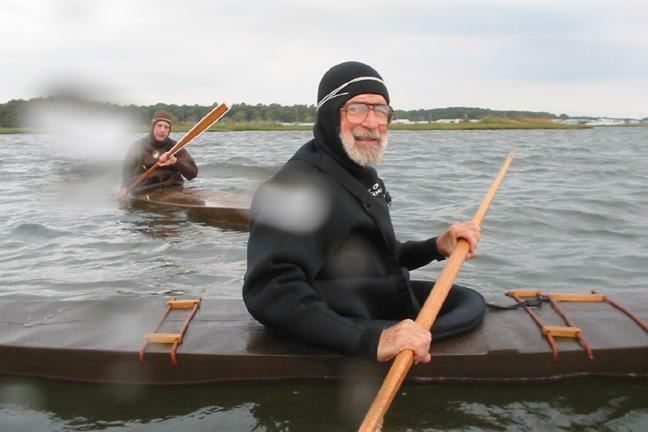 Later that year, at the Delmarva Paddlers’ Retreat, I was very relieved that I’d done so when Golden and I talked about that feature of the two kayaks. 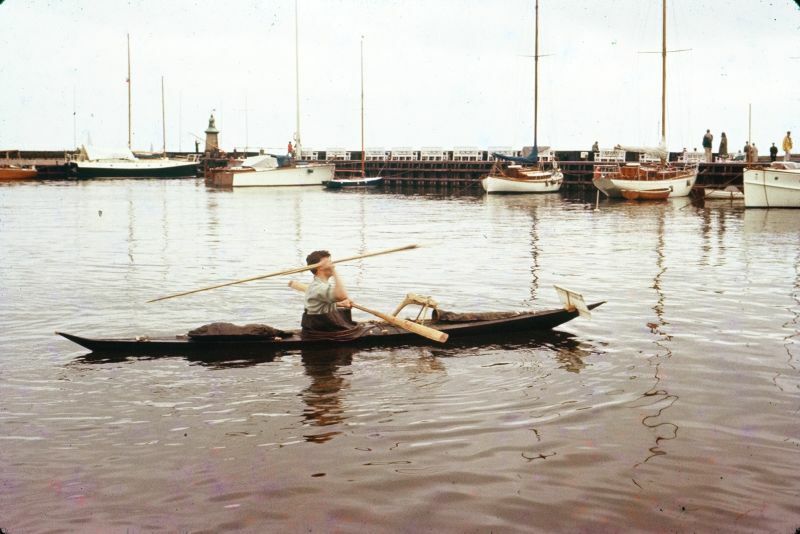 In this photo of one of the Nuugaatsiaq men carrying his kayak at Umiamako, I think you can see a pequngasoq-like shape to the hull of his kayak. And here in a photo from Saatut, another of the villages in Uummannaq Bay, a kayak (in 1957) with a pequngasoq-like hull. 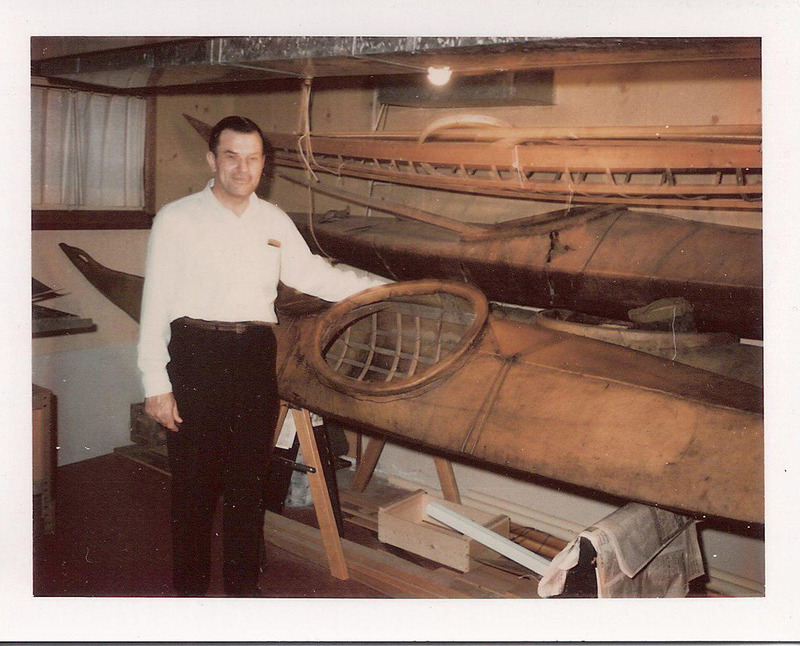 This is John Heath soon after he received the Illorsuit kayak frame. That’s it hanging above the two Alaskan kayaks with its cockpit coaming, out of position, sticking up above the gunwales. 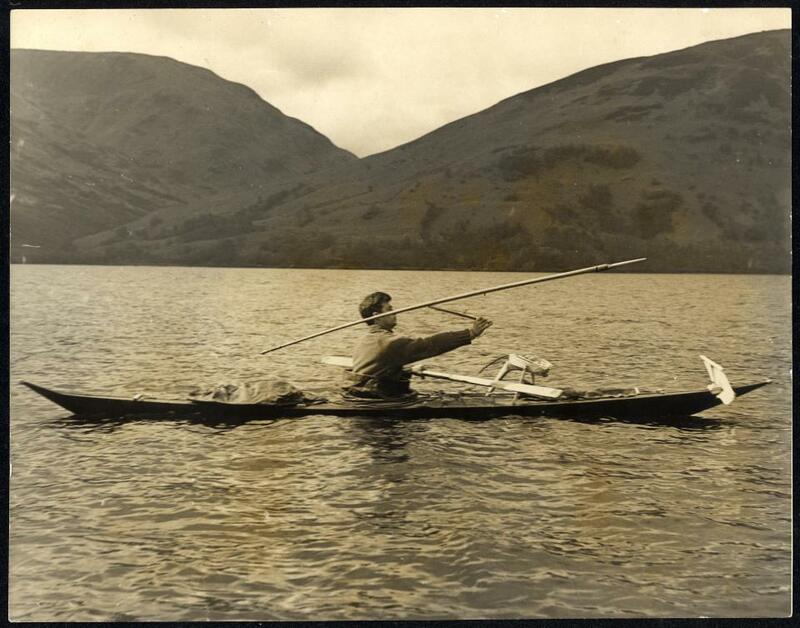 A photo from the day, in the spring of 1960, when I showed and demonstrated the use of the kayak at Rowardennan Youth Hostel on the shores of Loch Lomond. This could not have been more appropriate as Duncan Winning and I had both been members of the Scottish Hostellers Canoe Club (in Britain kayaks were still being called canoes) and my first ever kayaking had been on Loch Lomond. The elegant sheer of the kayak shows up well, with the characteristic Uummannaq Bay slightly raked stern. Please note: I see that I’d put the harpoon line tray one deck thong too far forward and facing a little too much to its right (see details following the photo taken at Hellerup Harbor, below). The use of the throwing stick shows nicely, though. I’ve forgotten the name of the man who took this and several other photos, and kindly sent me 8 by 10 glossies of them. If you ever see this website, I very much thank you again and hope you’ll get in touch. Squeezing into the kayak with the help of a good pull on a fore deck thong. That thong would’ve been tight originally but, even in Scotland, it was warm enough that the sealskin was stretching. You can see one of the splices where the continuous length of thong being used wasn’t long enough to yield all four deck thongs. In my lap are the dead eye, clasps and points of the “suspenders” for the tuilik full jacket. These suspenders would be used when a kayaker was travelling or hunting, holding up the considerable length of the jacket. The fittings, of course, are designed to allow for a “quick release” if ever the kayaker needs to roll his kayak in an emergency. I never did see anyone using a tuilik in that way. And in my photos we are always using the jacket for rolling instruction and practice so the clasps that catch on the dead eye are released to open up the full length of the jacket. On the edge of the coaming ring you can see the strips of bone and wood that help the bottom of the jacket stay in place. To keep yourself and the kayak watertight, the tuilik has to be tied so tightly around your wrists and face that for those of us who don’t have the wide cheek bones of the Inuit it’s very uncomfortable. On the jetty, someone’s wearing my kamit sealskin boots. And, me “chest sculling/side-bracing.” I love this photo as it shows so many details of the kayak – the raised seams on the decks from the sewing on of the seal skin cover; the skin patches needed to fill the gaps between the ends of the four original skins; the deck thongs and their bone and ivory fittings; the flat or “slab” side of the hard-chine hull; the tuilik full jacket; the tip of the stern floating free of the water; the ivory tab piece that helps keep the harpoon in its place; the thongs on the after deck with one of two sliders in view; etc. Meanwhile various people had been making the several items of hunting equipment for my kayak. Johan made the harpoon, with throw stick, and paddle plus the same to go with Heath’s kayak frame. Also he made an especially fine harpoon line tray which he and his family gave me as a gift! Anni Møller made the tuitoq while Emilia Nielsen made the tuilik, with Enoch making the various ivory fittings for this. I saw him at the job one day using a traditional style bow drill with one end held in his mouth. The avataq hunting float was beautifully made by Karli Zeeb. Sophia made a fine pair of two thumbed mittens for me, actually without removing the hair. And, of course, early on in my stay Anna had made my kamit. With Bearded Seal so few and far between, we agreed that there should be no harpoon line. I already had a harpoon head someone had given me early on. I no longer remember who made the gun bag, the white screen, and the skeg, but someone did and they completed the equipping of the kayak. Later that year in Hellerup harbor, north Copenhagen. Gerda and Jørgen Rølling, friends of Bent Jensen, with two of their daughters. I’m carrying the kayak in the usual Uummannaq Bay way, with my right arm under the masik and my thumb hooked over the knee bar. Because of the relatively warm weather also in Denmark, the sealskin thongs holding the harpoon fore shaft to the body of the harpoon have stretched. Originally shaft and body would have been “in a straight line.” Here you can see the harpoon line tray (asalloq) with its stout “pistol grip” leg (correctly, this time) hooked onto the third (asallerfik) deck thong, its remarkably flimsy left hand leg kept in place against the longish spar of wood wedged under the left end of usually three of the four deck thongs. It’s that same spar of wood that the end of your paddle can be tucked under to help in balancing the kayak when stationary. Also the self-supporting right hand leg of the line tray with a deep hook at its base to hold the harpoon shaft and how the line tray is canted forwards to let the harpoon line uncoil readily. Further back, the bone tab sitting on the bulge at the end of the masik also for holding the harpoon in place and ready for use. And, of course, the throwing stick clipped in place on the harpoon. Not to mention, which surprises some people, that the harpoon is pointing backwards! You can see how the coaming ring is attached to the deck skins with small bone pegs – on the inside of the coaming around the sides and front and with the skin brought over the coaming and pegged on the outside at the back. About the gun bag. Here you can see how the front end of the bag is tied to the bow deck thong and you can just make out that I have the ivory hook holding the open mouth of the gun bag attached to the fourth deck thong. BUT, that is not its correct position. 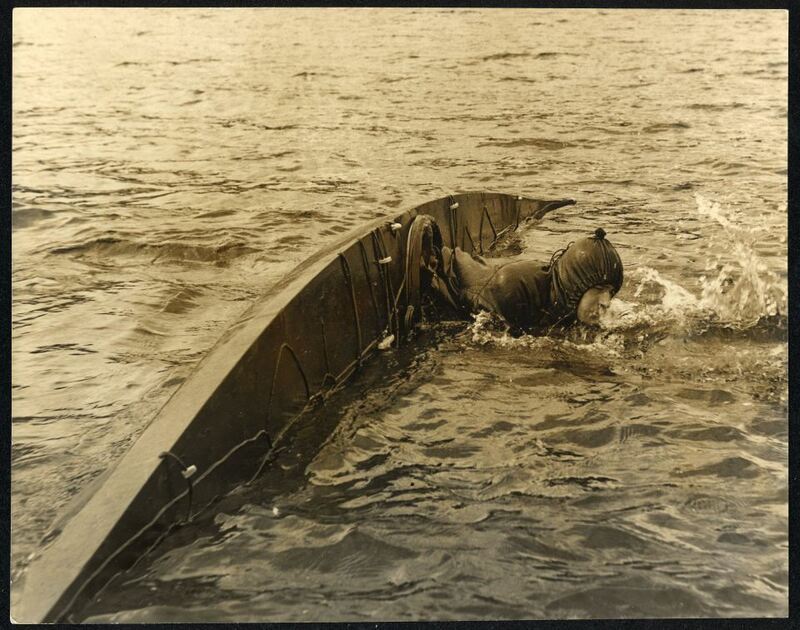 As you can see in the photos in Chapter Eight “The Hunting Trip to Umiamako,” of Tobias preparing to tow a seal he has just caught back to camp, the open end of the gun bag should be much further back, underneath the harpoon line tray. I want to emphasize that the harpoon as you see it in this photo (and in umpteen other of my photos of men actually engaged in hunting) is in its correct place and is ready for use. During the time I was in Greenland, all the hunters that I saw (and photographed) kept their harpoons in place in this way. 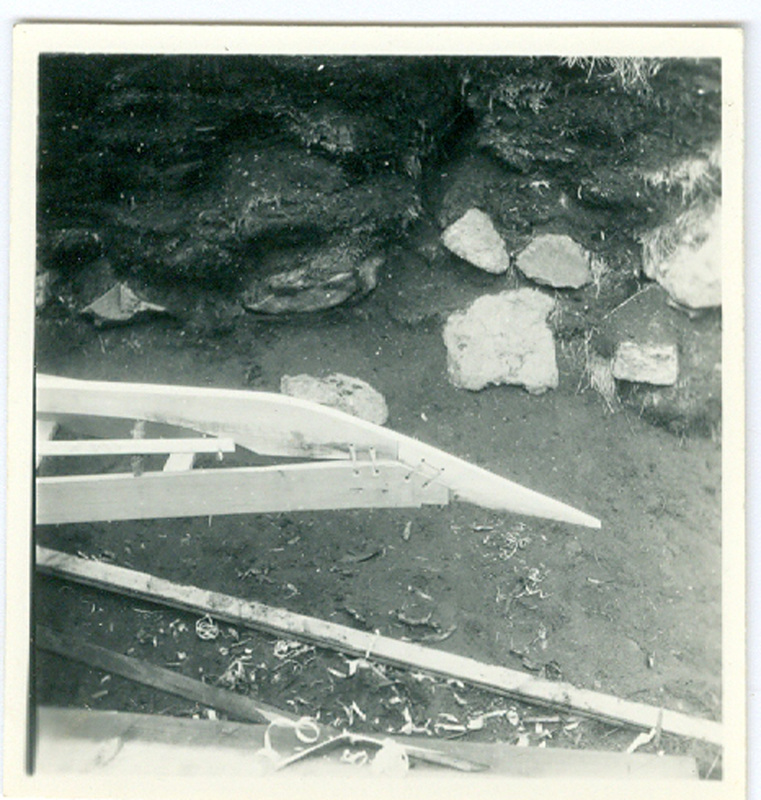 The harpoons I saw in 1959 did not have the two hanging straps attached to the actual shaft of the harpoon that Petersen describes (1986, page 76). 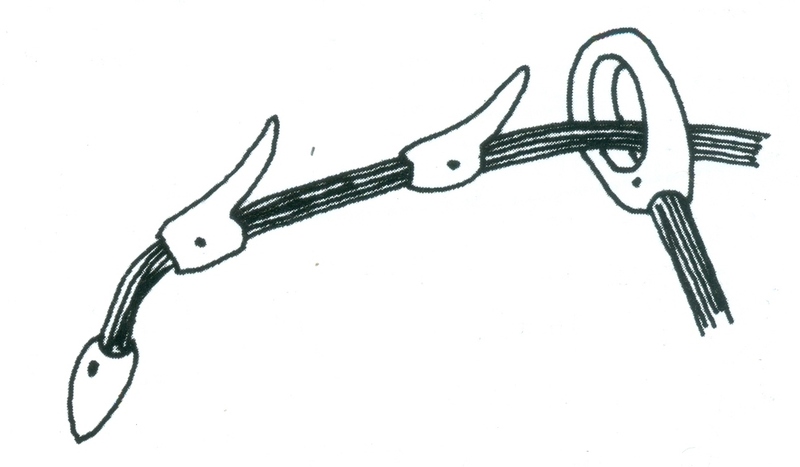 What they did have was one short thong with a bone button on its end attached to the throwing stick. 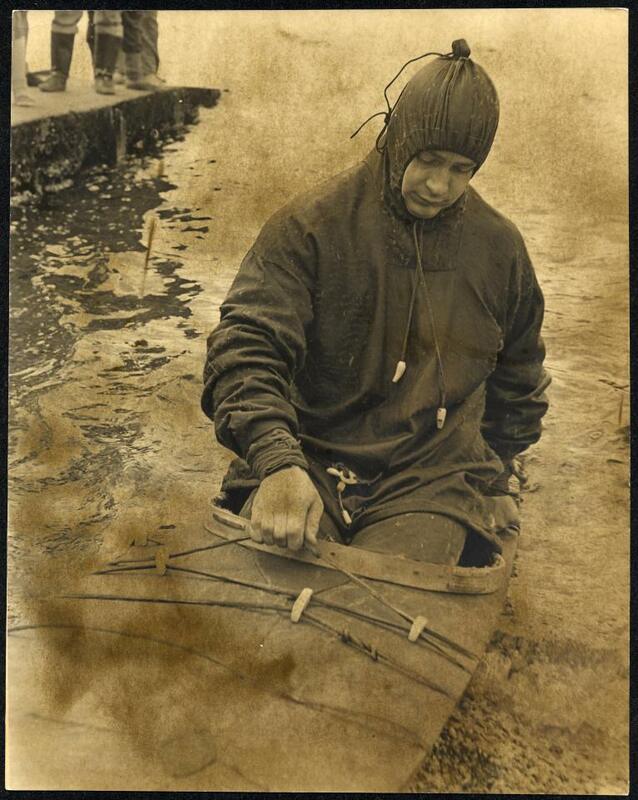 This allowed them to dangle their harpoons in the water for its coldness to tighten up the straps of the harpoon, while and only while they were settling themselves in their kayaks and making sure that all their hunting gear was in place and ready for use. By going out with the hunters in my Scottish kayak, I was there to see where the harpoon was placed when they began to hunt. As soon as they set off they lifted their harpoons into place as shown in this photo. Showing how to throw the harpoon, at Hellerup. And now the harpoon is pointing forwards. As you pick it up by the throwing stick you have to rotate it, horizontally, in mid air to have it point forwards and to have the throw stick in the correct position for use. By the way, the trim of the kayak is very slightly “off” in this photo as I do not have shotgun and rifle in place in the gun bag. In Chapter Six “Skinning the Kayaks,” I describe how there were not enough of the needed Harp Seal skins in the village and I was only able to accumulate the four skins needed for one kayak by buying two skins at Nuugaatsiaq. And at that, it was only a few days before I had to leave that we got hold of the fourth skin and were able to quickly sew the four skins together end to end and get them sewn on to the kayak frame and so complete “my” kayak. So, it was just not possible to skin Heath’s kayak and he ended up receiving just the kayak frame or skeleton plus a harpoon (and throwing stick) and a paddle. The completed frame of the replica Golden made of Heath’s kayak. As he explains on his web site “www.traditionalkayaks.com” the wood he used for the gunwales was recycled from another project. and, very successfully, in the water (Golden is performing an elegant side scull). He was pleased with it: “Despite this kayak being an augmented version of the typical Illorsuit hunting kayak, it performed superbly and it didn’t feel particularly big to me. It is voluminous, but at the waterline is not particularly wide, so feels nimble” (KoG, page 354). Heath’s kayak is now being looked after by Greg Stamer of QajaqUSA. Here are two recent photos showing what good shape it’s still in. And again, from bow to stern. “Anas Acuta,” by the way, is the scientific name for the Northern Pintail Duck. You can see how its distinctive tail made its name a good choice for the kayak. Again at Delmarva 2004, just after I’d finally launched the replica. That’s Harvey Golden keeping an eye on me (I hadn’t been in so tippy a kayak for many years). 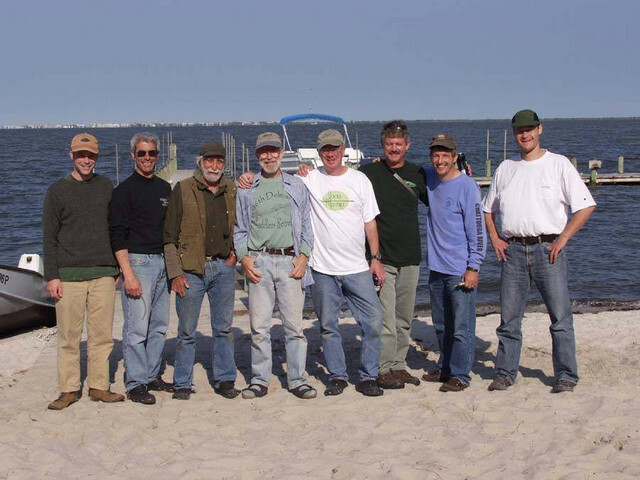 A group photo at Delmarva 2004. From the left, that’s Harvey Golden again, Dan Segal one of the Walden Pond self-named “Pond Scum,” Richard Nonas who I thank for his encouragement in the Introduction to Chapter One, myself, Vernon Doucette who converted almost all of the color slides to digital images, cleaned of mold, Greg Stamer who now has care of “Heath’s kayak,” Will Bigelow, also of the Pond Scum, and Pavia Lumholt, a Dane whose mother is a Greenlander.